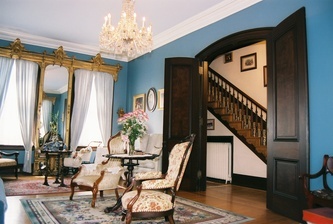 The elaborate parlor is the crown jewel of the The Historic York Inn / Smyser-Bair House. 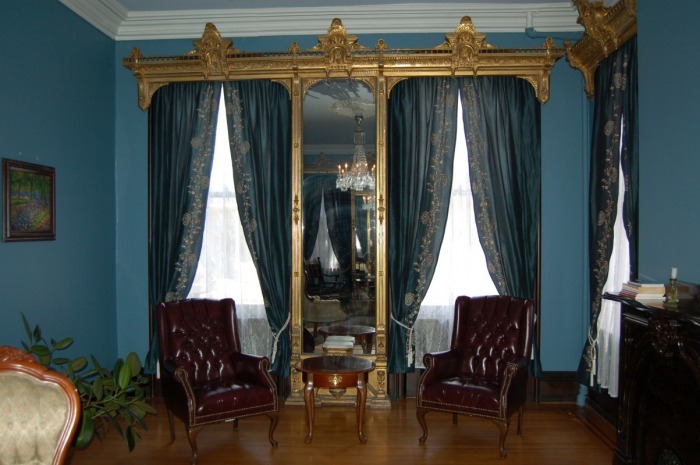 The most striking feature of the rich, blue room is the one-of-a-kind set of hand-crafted, gold leaf Pier mirrors. An appraiser sponsored by HGTV said that the mirror set is literally one-of-a-kind. There is no other known set like this one in the world. A subsequent appraiser and archeologist examined and reseached the mirrors and agreed. Even some of the antique Pier mirrors on display in the New York Metropolitan Museum of Art, Russia’s Hermitage, and Paris’s Louvre pale in comparison to this unique set. 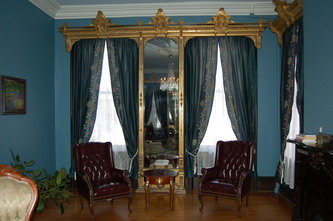 The mirrors were commissioned by owner Henry Smyser in the mid 1800s and hand crafted in Italy. According to the story, gold from Henry's own California Gold Rush expedition was sent to the craftsmen in Venice and used to guild the mirrors. Smyser then had the mirrors transported by ship to the United States. The mirrors also serve as drape covers and marble-crowned plant stands, making them even more unusual. 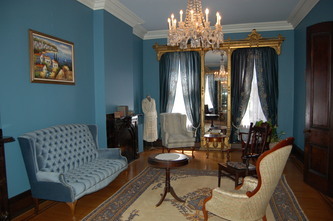 The parlor features two stunning marble mantles, an antique crystal chandelier, enormous double doors of heavy wood with ornate hinges and door knobs, hand-crafted ceiling medallions and crown molding of plaster, and a collection of antique furniture that is beautiful to look at and comfortable to relax in. We’re sure many receptions were hosted in the Parlor by the Smyser-Bair family. We expect that tradition to continue.